Did this card get removed? It's from GVG, you can only see it in wild, arena and tavern brawl. Thanks. It took me an embarrassing amount of time to figure out the filters. This card is a lot of fun if you can get it into play w/o losing it before it has a chance to do it's thing. I have this in a shaman deck and try to support it with Ancestral Spirit. Makes quick work of an enemy board that has taunts in it. One time I added WF to it and completely cleared a full board. 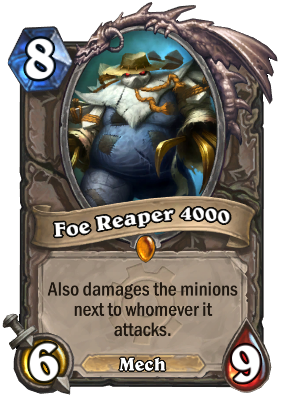 If you buff Foe Reaper, does it also do the new damage to the minions next to it? You realize the odds of ever replicating that game-state are probably like ten billion to one? I love his hat. he is killing like 50 minions and chilling with a straw hat. 8 mana 6/9. If it lives to attack, you get amazing value. Great, right? Then you look at Gahz'rilla. 7 mana 6/9. If it lives to attack, win the game. And 'Rilla doesn't get played in constructed. 6/9 is perfect stats.Impervious to Big Game Hunter. Not bothered by LightBomb (deal damage to each minion = to its attack). Good way to hit minions protected by taunts or ones that are cloaked. Can choose to target a smaller minion w/o taking the damage it would if it attacked the bigger one directly. Impervious to AOE and most direct spells. Why slice your enemies with beasts when you can use the NEW Foe Reaper 4000? SLICE YOUR ENEMIES 3X FASTER! His powerful blades and high speed moves make it faster to chop down anything you want! The future is NOW! Say goodbye to Druid of the Claw! Foe Reaper 4000 vs. Ironbark Protector!! This guy was so OP when I was rank 22. Unfortunately due to the fact that the aggro decks dominate hs, It can't be placed in constructed ranked games. If that change and we get a more control type of gameplay, then it will have many potentials.